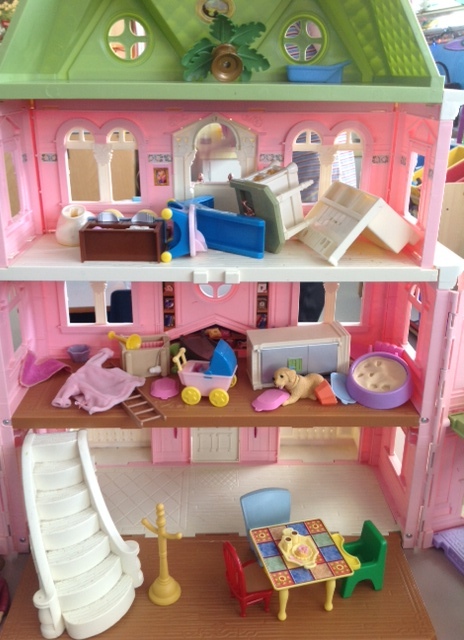 We find the state of the dollhouse can be indicative of how we’re doing. From the looks of things, it appears we’re having a complete overhaul. We’re having a renovation at school right now, across the hall from one of our classrooms. Both divisions are affected as the playground area between our two classes is filled with work trucks and a cordoned off worksite. But…we’re heading into Week 2 now of the renovation, and the Kindergarten teachers’ nerves are just about frayed. There’s nothing quite like story time with the whirring of a table saw as your background. Or teaching the sound for “y” (the letter of the week) to the echo of rapid fire from a nail gun. We were heading outside for PE and as we opened our back classroom door, one of the students said, “Hey, there’s four trucks out here!” So much for bringing out the playground balls. We think it’s time for some self-regulation…. You all might have guessed we’re huge Todd Parr fans by now. We refer to his books often. 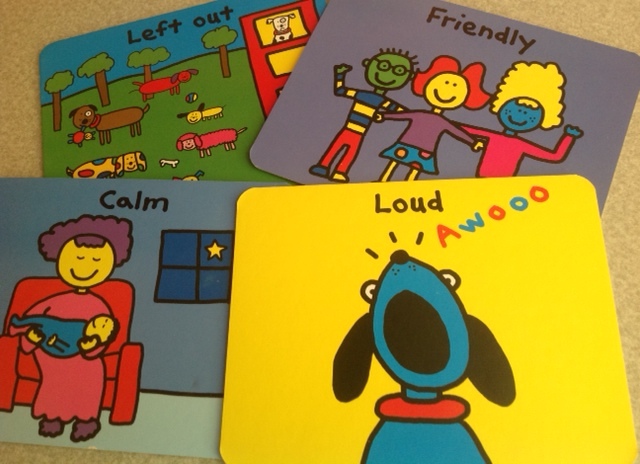 At a district Professional Day last year, we were introduced to the Todd Parr Feelings Flashcards by the Learning Support Team from Westcot Elementary in West Vancouver. We’ve been using these cards weekly with our classes as one of our HACE (Health and Career) resources. Both sides of each card are labelled and gorgeously illustrated with a different feeling. At the start of the year, we taught each feelings card, beginning with “happy,” “sad,” “angry” and “disappointed,” as those emotional descriptors we felt many of the children would know and already understand. Sometimes things happen in class; it’s a teaching and learning opportunity, so we gather together at meeting time and pull out the appropriate feelings card to generate a discussion. We’ve talked about what it means to feel “left out” and “shy.” The children are very serious and open about their feelings, and want to share their personal experiences about a specific emotion, particularly if we’re trying to solve a problem. It’s important to talk about our feelings, and we connect those descriptors back to the Zones of Regulation and try to tie together how we feel with the actions we sometimes take, as a result. With the on-going renovation this week, the teachers have made excessive use of the “calm” flashcard. We’ve explained that exciting as it is to have a renovation at our school, it’s also frustrating for us as our environment is noisy and it’s difficult to teach. We want to feel calm; that is the optimal zone for both learning and teaching. The children are making good suggestions for us to “down-regulate,” and bring our emotional state down from the frustrated feeling of the Yellow Zone to the calmness of the Green Zone. We’re doing a lot of deep breathing, counting backwards from 10 and listening to quiet music, and the children are happily leading us. The children are aware of, and beginning to articulate, their emotions while demonstrating empathy for how others feel. They are very sophisticated in their ability to self-regulate. 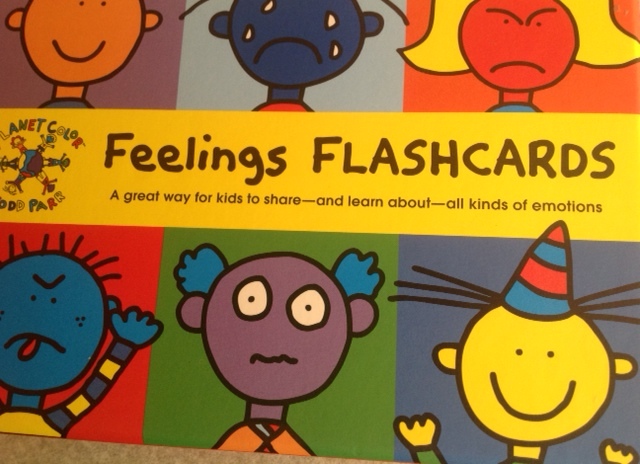 We were able to order The Todd Parr Feelings Flashcards from Vancouver Kidsbooks or you can purchase them directly through Amazon.